The Hampton Inn & Suites Claremore hotel is strategically located in the fastest developing area of Claremore, OK. Nestled on the edge of the business district, we are minutes away from Claremore’s historic downtown, which features many specialty stores and charming antique shops. Tulsa International Airport is only 20 miles away, and we are just moments from many large companies and industries, making us an ideal base for business and leisure travelers. Retire to a spacious guest room or suite at this contemporary hotel in Claremore, OK. Each room features modern decor and amenities, including free WiFi, an HDTV, a microwave, refrigerator, coffeemaker and work desk. 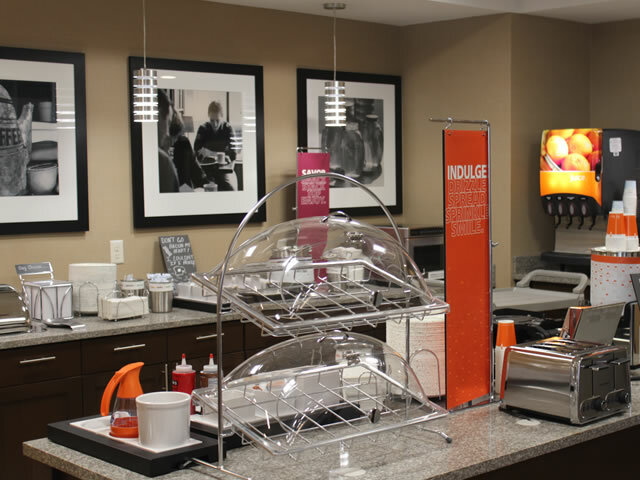 Get a great night’s sleep in the clean and fresh Hampton bed® before waking up to Hampton's free hot breakfast, featuring our famous fresh-baked waffles. If you have an early start, pick up a free Hampton On the Run™ Breakfast Bag, Monday through Friday, for a quick, healthy meal to go.